I noticed something interesting in this picture.Just look at vettel. He didn't practice in any of his RBR gear as he didn't bring spares and would then be all sweaty and gross for the main event. Prob borrowed Michael's shoes like he borrowed the ROC suit. Nah I'm terminally slow (except on horses), that's why I don't drive anymore. Honestly speaking - I'm pretty sure if I ran into him somewhere I'd just pass out on the spot. Hopefully he'd notice and come to my aid, and hopefully I'd require mouth to mouth resuscitation. what is with the stupid chicane on the bridge? Michael and Sebastian made them put the chicane in because the cars were all getting crazy air, and constructed it themselves Schumacher esses. I live in Thailand and am SOOO tiddled off that I couldn't go to see this event! AFAIK, its not even being shown on TV, which is a bit odd for an event that's being held in Thailand. Seems the competition gets weaker each year. Who was there? 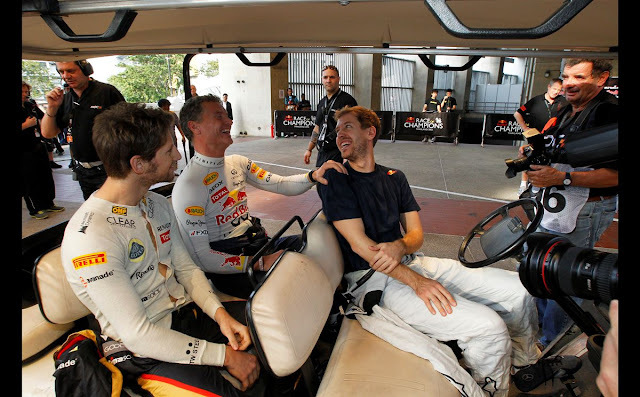 Coulthard, Grosjean, Ogier. There's always people you don't know but perhaps. The # is a bit thin this year. Without the nobody's from the host nation and Team India (Karun and Narainman) it would be particularly slim. Some thanks are owed to Red Bull for propping the "grid" up and being a big partner in their nation of origin. Last edited by rife_hypocricy on Sun Dec 16, 2012 2:03 pm, edited 1 time in total. Ok, he did in 2001-2002 - Lol. He won the nations cup in 2001. That's quite a long time ago. What about him and LH joining the ROC and give vettel some competition in equal cars. Seb touched the wall slightly and destroyed the KTM suspension apparently. Last edited by Akai on Sun Dec 16, 2012 3:14 pm, edited 1 time in total. Last edited by M.Nader -DODZ- on Sun Dec 16, 2012 3:46 pm, edited 1 time in total. Does not make him a good F1 driver. I also think ROC should be about just that, the race of champions, not past champions and randomly picked drivers who are up for it, it seems each year less top drivers are up for it so the competition continues to get weaker each year. why? It's never been about that. It's a bit of craic at the end of the year. Just enjoy it for that rather than put some arbitrary rule down . Besides, take out past champions etc then you have to say bye bye to the likes of Schui. Remember the initial idea was for rally drivers. Last edited by Johnston on Sun Dec 16, 2012 4:05 pm, edited 1 time in total. Okay, you go convince them all to show up then. Its meant to be fun - can't just enjoy it for what it is?